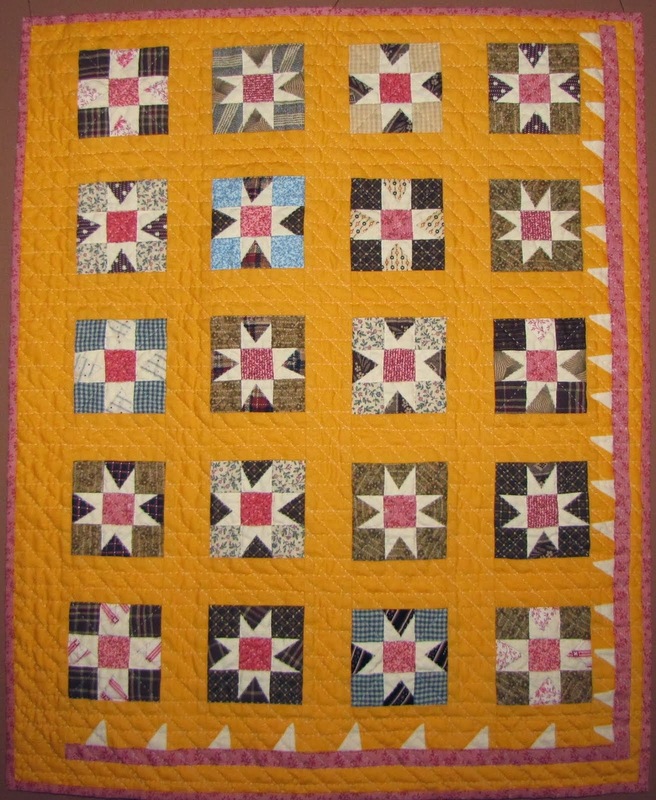 This is one of my cheeriest quilts, you can definitely see it was made in the transitional period between the dark Victorian quilts and the bright 1930's quilt. 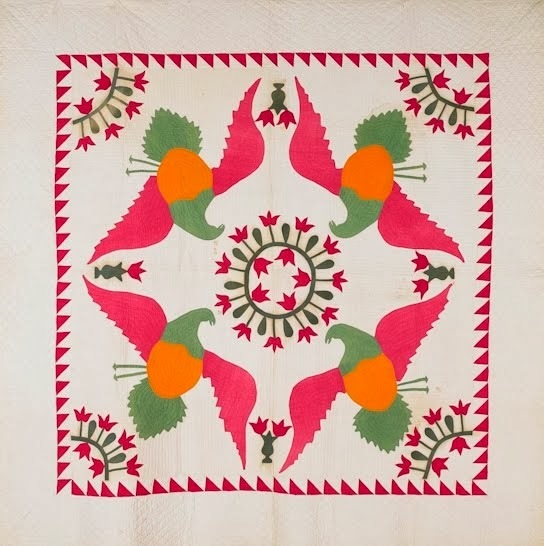 It is a circa 1910 Goose in Pond quilt and from Ohio. It is a fairly uncommon pattern to find and I was quite pleased to find it. 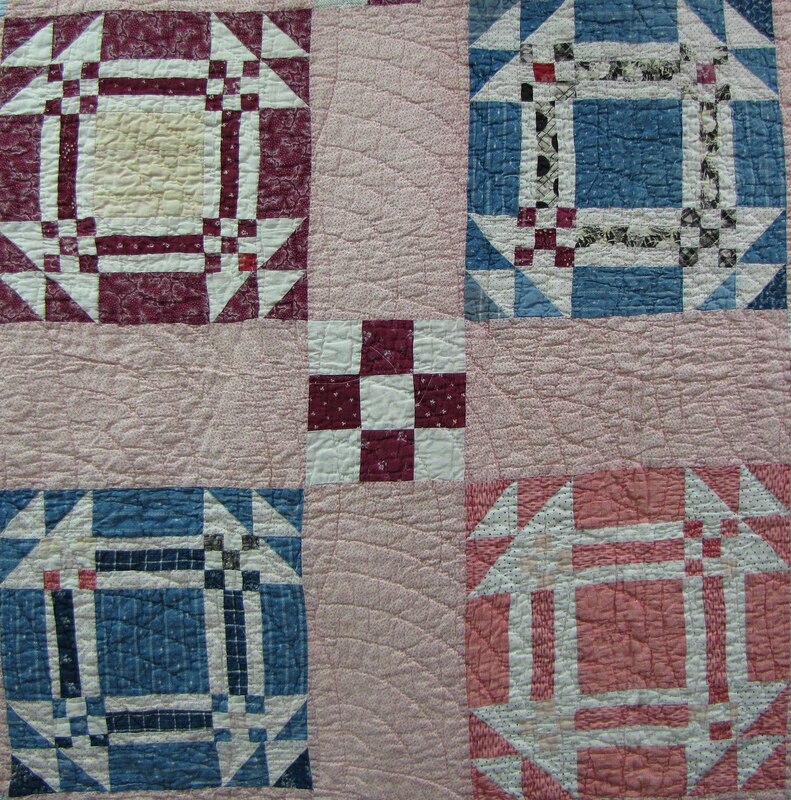 Here is a four block section, note again the blues and burgundy of the first quarter. 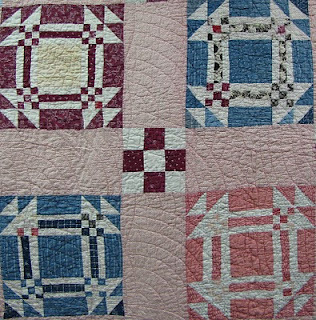 Also the simple functional baptist fan quilting, another dating clue as this wasn't the time of elaborate quilting. Here is one of the two blocks that have sawtooth 'coping strips' to make them fit into the top. Blocks like this always interest me, wonder what happened . 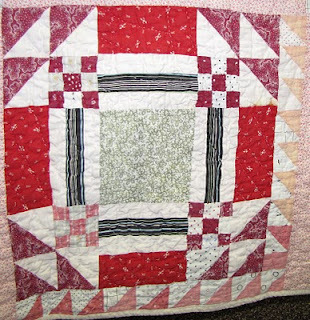 . . was it a group quilt and some people didn't read the instructions, did the maker decide to recycle blocks that weren't quite the right size or did she really have technical difficulties???? 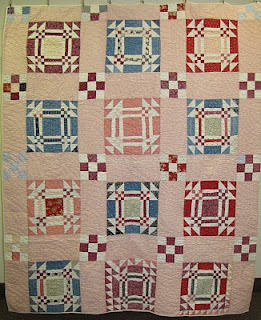 In spite of, or maybe because I'm such a diehard on my own quilts, I love these 'maverik' or what was she thinking quilts (thanks Julie Silber for one of my fav. quilting phrases). 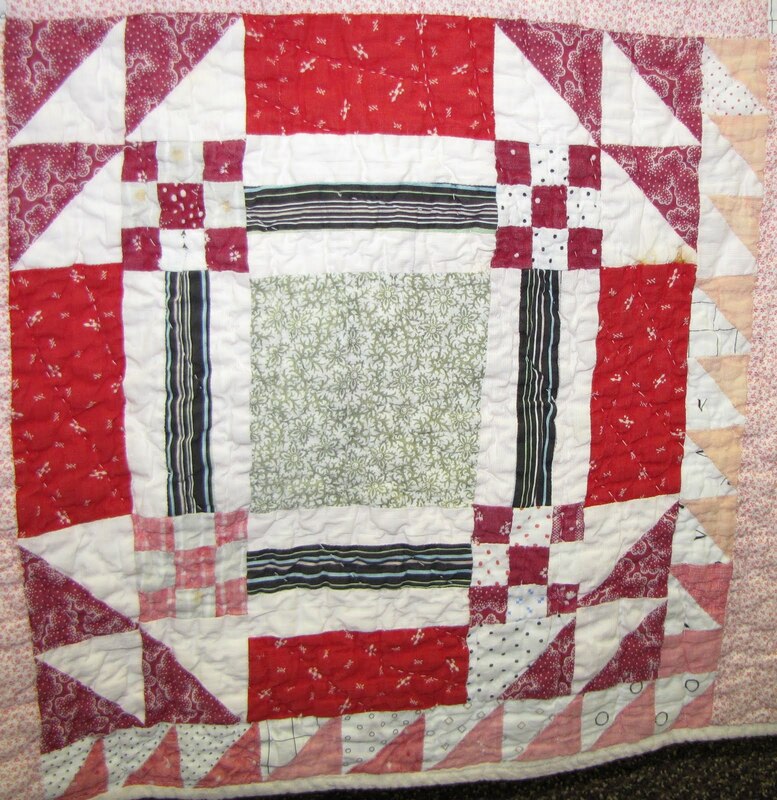 It may be the person was a new quilter as this quilt has another unusual aspect: 3 different binding techniques were used - self binding (back brought to front), applied binding, and a knife edge. Again, don't know if it was a group quilt or a practice/learning quilt. 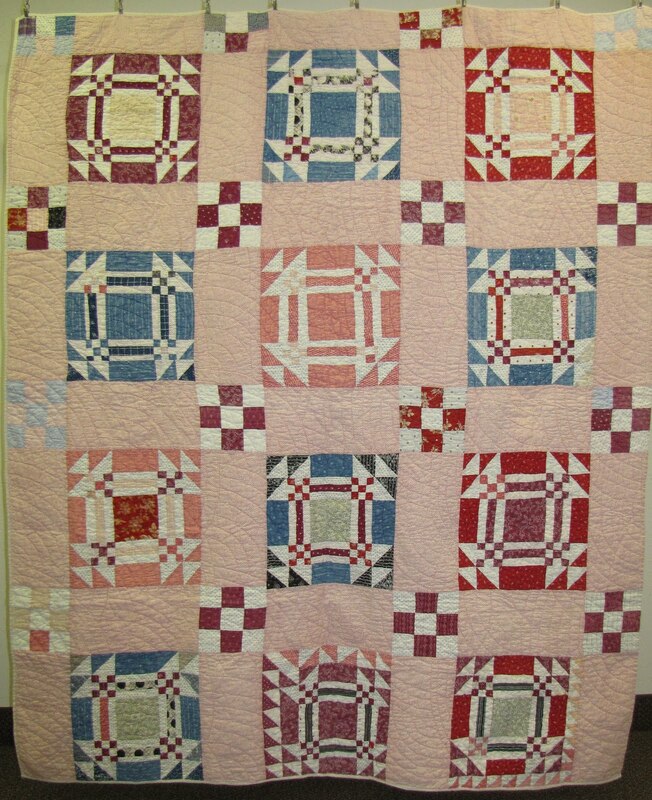 Oh, this is one of my absolute favorite quilt patterns, and I plan to make it one day from men's thrift store shirts in R/W/B! So curious about the random sawtooth borders. And three binding techniques? Interesting.